I Need YOU big time! Let's get it straight, the number one reason because I was pretty quiet since this summer: Piracy happened. Aftermath is at least 50% less income..and this is a BIG deal for a one-man business. For years I have been offering super low access prices and never ever followed economics, taxes increase etc... while I understand piracy and the free for all concept, it is just that economic reality is what it is and I may not be able to survive it for long. I am forced to up the prices a bit by now. While new things are in the R&D stage, past work is what feeds the actual work. 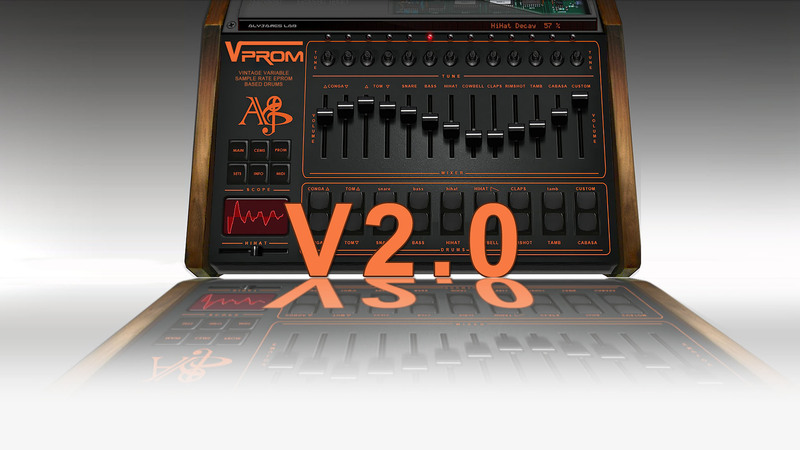 I will need you big time in order to continue and that is why I am releasing publicly the last VProm VST update 2.0.4 as a donation based update starting at 5 Euros, those who can afford to support more than the minimum are very welcome to do so. New features in 2.0.4 are detailed bellow, one of them should have been implemented years ago but wasn't efficient enough at that time. When you try to emulate past technology like variable sample rate reading, one thing might be overlooked, there was no final soundcard sampling rate to begin with. That means that any resampling artefact that might happen on high frequency spectrum for high frequency heavy sound source such as for example a tamborine will mess up the frequency content when the playing sample rate/tuning is not a perfect multiple of the soundcard actual sample rate. That crunchy sound we all like when something is played at a low sample rate is often mislabelled as aliasing...to simplify let's say there are good and bad aliasing, the good one keeps the original frequency content with additional harmonics perfectly related, the bad one will add unrelated harmonics that might or might not be desirable. On the original hardware, the bad one wasn't there and you have now the option to activate a x16 oversampling processing to get rid of any artifacts on TAMB, CAB, HIHAT and EXTRA voices, it works at any sample rate. While most of users may not notice at first, a voice that is high frequency heavy will alias badly at 44.1K sample rate and even at 96K, it will color the sound in a way the original hardware didn't, some might like it, some don't, hence the optional switch. Once engaged the TAMB, HIHAT, CAB and EXTRA EPROMs are oversampled 16 times to get rid of most of the aliasing produced by high frequency harmonics reflection and will sound perfectly at any tune, keeping the harmonic relationship intact. Precisely it will oversample by x16 at 44.1 and 48K sample rate and by x8 above, you will have something like 768K internal processing if running at 96K, though it is kept very light on CPU! 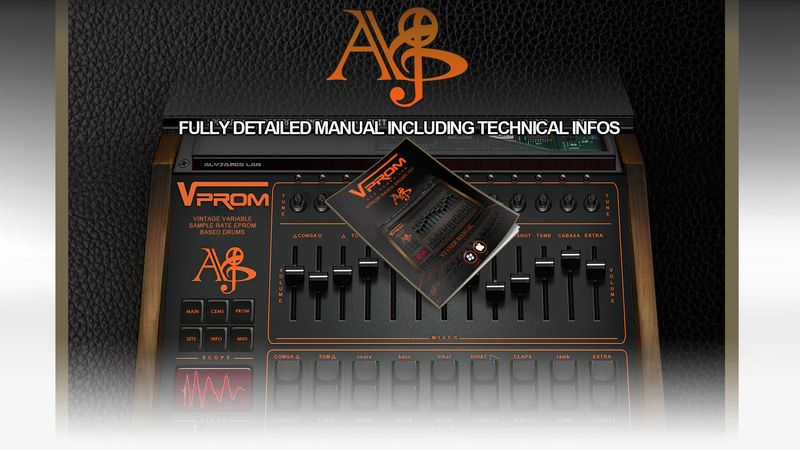 I would advice to use either TAMB, CAB, HIHAT or EXTRA PROM slots to load any high freq heavy custom EPROMS, they will sound better oversampled at least if you want no nasty coloration, just test on the tambourine and you will hear it. 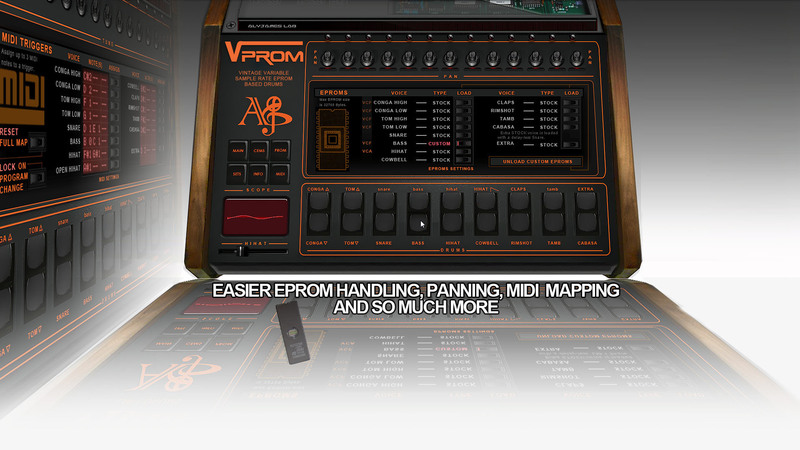 this is just one of the new features you will see bellow, I hope you enjoy making funky grooves with VPROM as much as I do! You can check your current version inside the INFO panel on the GUI. New CHOKE feature to instantly stop the playing of the Extra voice at any point, useful for choking cymbals and other creative ideas..
Be sure to use your original Email and Name as registered, if using a different Email be sure to write your registered name into the comment box! Thank you for willing to support my work. 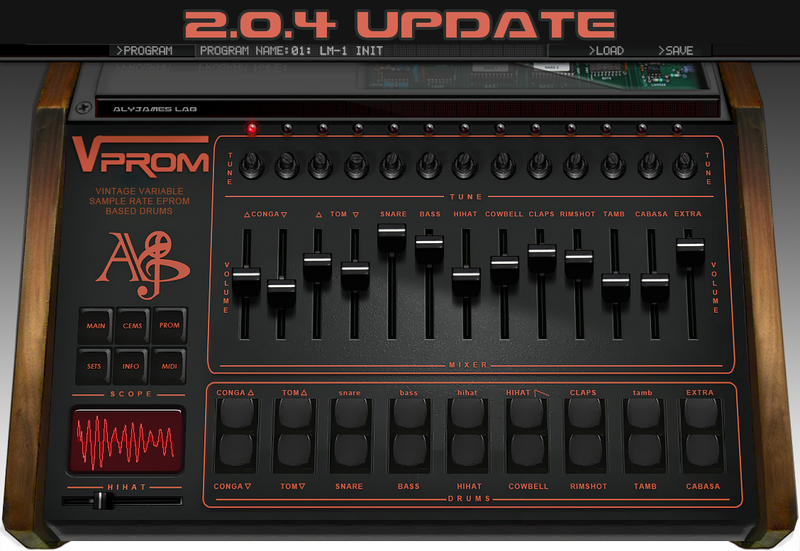 I will need you big time in order to continue and that is why I am releasing publicly the last VProm VST update 2.0.4 as a donation based update starting at 5 Euros, those who can afford to support more than the minimum are very welcome to do so. You will support me to make the creation process going on and make those musical ideas alive! Once your donation is accepted you will receive an Email with instructions and the VProm software link within 3 days Max. Be sure to authorize incoming mails from info@alyjameslab.com and alyjames.info@gmail.com in case they would be blocked by your spam filter. IF PAYPAL DO NOT WORK FOR YOUR COUNTRY, DROP ME AN EMAIL I WILL SEND YOU AN INVOICE WITH THE AMOUNT OR GIVE YOU AN EMAIL ADRESS TO PROCEED.